Elliot Anderson’s (Kevin Costner) life became unbearable for him when he lost his wife in a tragic car accident, and he suddenly finds himself as sole guardian to raise his 7 year-old granddaughter Eloise (Jillian Estell) alone. The loving couple has assumed custody from the moment their own daughter died giving birth to the little girl. The girl’s father is unable to take custody due to his drug-addtiction problem and was behind bars that time. 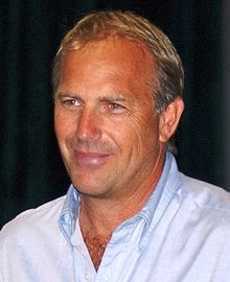 Costner visiting Andrews Air Force Base in July 2003. She approaches Elliot about setting up visitation, in spite of her son’s substance abuse problems, since Eloise has a lot of other relatives on her father’s side of the family eager to see her. But the wealthy, white lawyer balks at the very suggestion, presumably because they’re black and from the ‘hood, and he’s thus far managed to shield his relatively-privileged granddaughter from the ghetto and its host of woes. Of course, Wee-Wee doesn’t take the rebuff sitting down, but rather prevails upon her attorney brother, Jeremiah (Anthony Mackie), to file suit. Next thing you know, the parties are slinging mud at one another in an ugly custody battle where Reggie is accused of being a crack head with a criminal record and Elliot is labeled a racist and an alcoholic. Responsibility for dispensing justice blindly falls to Judge Margaret Cummings (Paula Newsome), who might very well be a bit biased in favor of plaintiff Rowena, given that she’s also African-American and female. All roads inexorably lead to a big courtroom showdown in Black or White, a cross-cultural melodrama written and directed by Mike Binder (Reign over Me). Ostensibly “inspired by true events,” the picture pits a couple of worthy adversaries against each other in Elliot and Wee-Wee, as capably played by Oscar-winners Kevin Costner (for Dances with Wolves) and Octavia Spencer (for The Help). Any lawyer worth his or her salt knows that you never ask a question on cross-examination that you don’t already know the answer to. Nonetheless, Jeremiah violates that cardinal rule by asking Elliot, “Do you dislike all black people?” This affords the just-disgraced granddad an opportunity to rehabilitate his tarnished image courtesy of a scintillating, self-serving soliloquy reminiscent of Jack Nicholson’s “You can’t handle the truth!” monologue in A Few Good Men. If only the rest of this racially-tinged baby-daddy drama had matched that climactic moment in terms of intensity. Still, the film is worth the investment for veteran Costner’s vintage performance and for the way in which the timely script dares to tackle some tough social questions in refreshingly-realistic, if perhaps politically-incorrect fashion.